Please help our community — upload your photos of 11588712. This is a bolt, hex flanged head, m6x1x20, 17.5 thread, 14.2 outside diameter, 8.8, gmw3359 (int manifold sight shield), for Hummer, Chevrolet, Chevrolet Trucks, Buick, Buick Trucks, Oldsmobile Trucks, Pontiac Trucks, Cadillac Trucks, Saturn, Pontiac, Oldsmobile, Cadillac, GMC Trucks, Opel, and Vauxhall automobiles. It fits for 806 Opel\Vauxhall vehicles which were sold in the U.S., Europe, and the UK from 2000 to 2015. It's a genuine General Motors part with an OEM part number 11588712, and Opel\Vauxhall kat-code: 20 00 370. This bolt has a weight of 0.32 ounce, usually, it comes in a set of 1 item in retail packaging. This part has a standard 12 months Opel\Vauxhall warranty on replacement parts, and it may be returned to a dealer even if the packaging has been opened. This bolt comes in retail packaging with weight of 0.32 ounce. All the data on these charts reflect users search interest in GM 11588712 part based on search requests on oemcats.com website made between 2012 and 2018 years. Search interest in GM 11588712 part aggregated by months over time. 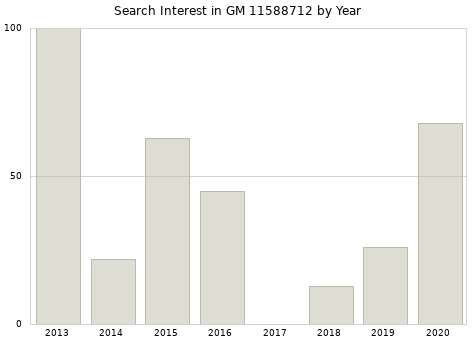 Monthly average search interest in GM 11588712 part over years from 2013 to 2018. 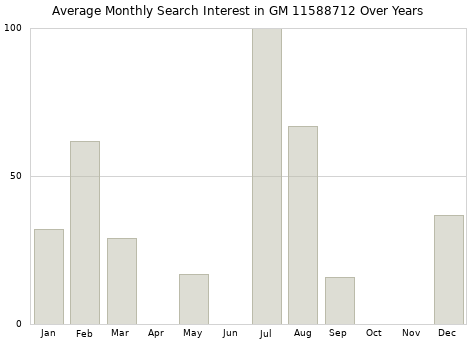 Annual search interest in GM 11588712 part. How to read the data. Numbers represent search interest on a scale from 0 to 100, where 100 is the period with the most popularity as a fraction of total searches during that period. All the data on these charts reflect users behavior on oemcats.com website from 2012 to 2018. GM 11588712 monthly average sales over years from 2014 to 2018. GM 11588712 part annual sales from 2014 to 2018. How to read the data. Numbers represent sales on a scale from 0 to 100, where 100 is the period when most sales occured as a fraction of total sales during that period. 11518062 is interchangeable with 11588712 since March 1, 2005 for the U.S. market.